In 1200, a castle first appeared to the south of Nebra, built into the sandstone cliffs. Referred to as the “Old Castle,” nobody knows why it was abandoned and a new one built in 1250 on the location of today’s castle. Two hundred years later, the Nissmitz family of Nebra acquired the castle and lived here until 1666. They rebuilt it in a Gothic and Renaissance style. During the Thirty Years War, the Swedes occupied the property. By the 18th century, the cost of maintaining the property meant that rooms were shut off one by one until the castle fell into a state of complete abandonment. In 1830, the village took it over. 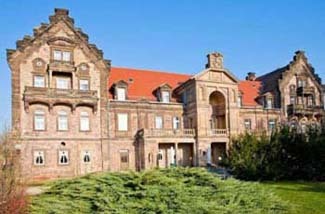 During the times of the GDR, the castle was used as an office and administration building. One of the more reasonably priced castle hotels around, this is an ideal place for touring cyclists. In fact, bicyclists are especially welcomed here. The hotel has no elevator, so those who are challenged by stairs may want to reconsider. Nebra is to the southwest of Halle. From highway 38, go south on 180 and continue onto route 250 to Nebra. The hotel is a 10-minute walk from Nebra’s train station. This friendly castle hotel is unpretentious and straightforward. Its reasonable prices mean you won’t find a lot of frills and extras, but you really don’t need them. Comfortable guest rooms have every thing you need for a good night’s sleep. All guest rooms are non-smoking and have en suite bathrooms with a bath or shower. Be sure to take advantage of the castle restaurant, which serves traditional regional dishes. A cozy bar is available for drinks, or during the summer months, you may sit outside on the terrace. Like the hotel, restaurant prices are a good value. No Internet is available in the hotel.